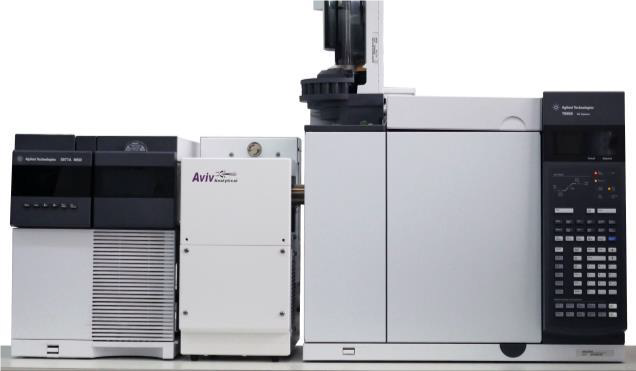 Aviv Analytical's laboratory is uniquely equipped with our 5977-SMB GC-MS with Cold EI and thus can analyze for you the most challenging samples. We can analyze large, polar and labile compounds that can-not be analyzed by any other GC-MS (or LC-MS) and provide trustworthy molecular ions plus their NIST library identification and/or elemental formula with our TAMI software. Synthetic organic compounds. We can analyze much larger synthetic compounds than any GC-MS, provide molecular ions, elemental formula information and chemical reaction yields. Petrochemical and Geochemical Oils and fuels. We uniquely provide isomer distribution analysis for optimized fuel/oil value plus molecular ions information for all hydrocarbons including highly branched isomers. Fats and triglycerides in foods and products. Forensic analysis of unknown compounds.